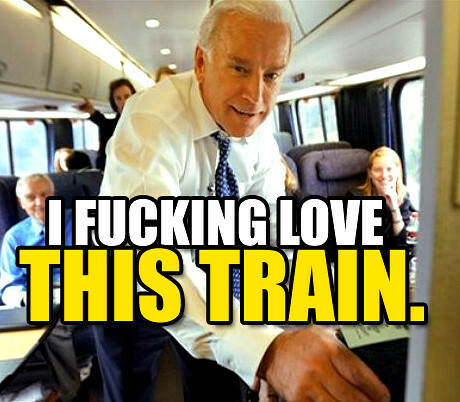 The Train of Thought: I Want Joe Biden? I Need Joe Biden? He's a master of colonial rhetoric and imperialistic statements on Iraq. He's prone to gaffes and is a great attack dog in 1 out of every 5 TV appearances. He doesn't really bring anything to the table, and he occasionally takes from it since his previous pro war stance doesn't really mesh with Barack's message. Again, he only looks like an OK option when you compare him with the other people being considered. The last two people on the list were Evan Bayh and Tim Kaine, so that really drives home how poorly I thought of Biden. Four years later, Biden hired the only progressive economist in the Obama administration, and his office was the site of the "Middle class Task Force", the only hope of progressive/pro labor economic measures in the Administration. He fought hard for trains and other infrastructure spending in the stimulus, and considering who he was going up against, he's probably the only reason any of it stayed in the bill. He was the main force (only, I think), within the White House arguing against an escalation in Afghanistan. And last Sunday, his honest statement on gay marriage completely screwed over Obama to the point where he had to come out in favor of Marriage equality, and who knows when/if that happens if he doesn't make that gaffe. So, it feels really good to be wrong. A salute to you, Joe Biden.